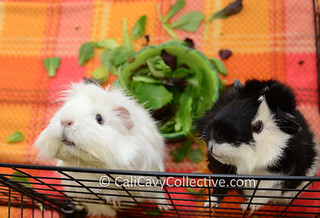 Despite the fresh bowl of organic red and green baby lettuce leaves behind them, Abby-Roo and Revy were still not satisfied with the options on the table. The two Abbys do not accept the explanation that home grown wheatgrass cannot appear on the menu daily. Certain piggies are becoming a little too accustomed to their gourmet treats. My pigs often do not accept the lack of certain veggies, as well. Such spoiled pigs! Too cute! I love their little faces! I agree that this is a trait shared by many pigs...Fergie is the worst offender in our house!